I first did a variation on this recipe years ago and served it up to visiting friends from New York – David (a Kiwi in disguise) and Rena. David’s previous experiences with bread and butter pudding had been the stodgy, soggy slabs served up in his childhood. There are few things I have ever cooked that have had such a transformational impact! My recipe has been a staple of David and Rena’s Thanksgiving celebrations for years. Whenever I am in New York I am required to cook it for them myself. And the difference? It pretty much boils down to using very good ingredients – and not stinting on the custard component so it is silky rather than solid. I use slightly stale good French bread and the egg custard is made from scratch. I am going to have to remake this and take photos again. I had Lulu and John around the other night. John has always been a fan of custardy desserts – creme brulee, panna cotta, creme caramel. I am afraid it was half gone before it occurred to me to grab the camera. Butter a flattish medium sized (lasagne type) dish. Thickly butter the french bread. Scatter half the raisins in the base of the dish. Arrange the bread so it is overlapping on the base of the dish. Scatter the rest of the raisins on top. The idea is not to have bread stacked up really high – as close to 1-2 layers as possible. Heat the milk and cream until simmering. Meanwhile in a large bowl beat the eggs with the sugar and nutmeg. Pour the cream/milk into the egg mixture in a thin stream and keep beating. Pour the custard over the bread. You can allow it to sit for up to 4 hours at this stage so you can prep in advance. I sometimes grind a little extra nutmeg on top. Place in 175C oven for approximately 25-30 minutes – or when the custard has set. My oven tends to cook a bit faster than others so you just need to check it. In theory, remove and serve at room temperature. In practice remove from oven, and allow to cool for long enough that your guests do not scald the roof of their mouths eating it. This is a biscuit (cookie) recipe that my mother used to make when I was a child. It is disturbingly simple with hardly any ingredients, and nothing exotic in there at all. The kind of recipe that you bypass in favour of chocolate chip. These biscuits are great! They go incredibly crispy right the way through and are very light. Not “short” or heavy in texture. They keep well in an airtight container and the ingredients cost pretty much nothing. I have no idea why they are called Grantham gingerbreads as there is nothing bread-y at all in their texture. Preheat the oven to 160º C and get 2-3 baking trays ready (line with baking paper or lightly grease). Sift the flour and ground ginger. Cream the butter and sugar and beat in the egg. I do this in my Kenwood mixer. Add the flour and mix until clumpy crumbs form. It probably won’t go into a handy big lump in the mixer but you can use your hands at this point and squash into a large ball. Roll into walnut sized balls and place on baking trays. Bake 30-40 mins till crisp & dark golden. Sorry about the looseness on time. I have a fan bake oven and it cooks them in about 30 minutes. Lamb shanks are one of my favourite winter meals. I grew up with a mother who was a) a very good cook, and who b) knew how to make delicious meals out of cheaper cuts of meat. They have become a lot more popular in recent years so that they aren’t quite the bargain they used to be. I am sure Mum has a special moment whenever she sees them in the premium cuts of meat section of butchers and supermarkets. Lambshanks take time to soften and grow tender. If you are gnawing on a piece of lamb flavoured rubber then they are undercooked. They reheat well and are a great option for a big family meal or winter dinner party where you need to do much of the prep in advance. Cook them on slow in the afternoon until tender. The recipe below isn’t so much a recipe for me, as my standard way of cooking lamb shanks when I don’t feel like doing anything more interesting. I have several other more exotic recipes that feature everything from dried apricots or prunes (more Moroccan than Mediterranean in style); or an Ainsley Harriott recipe where they have more of an Indian flavour with yoghurt and cumin. Very good. Halve the onions, and slice. Roughly chop the garlic. Heat the oil in a large heavy based pan over medium to low heat and cook the onions and garlic until softened and caremalised. Remove from the pan. Increase the heat of the pan and brown the lambshanks. Place lambshanks in a roasting pan and add onion mixture. Deglaze the frying pan with the red wine, then add the tomatoes and roughly break up with a wooden spoon. Add the salt and pepper and bring to near boil. Arrange the rosemary around and between the lambshanks. Pour or scoop over the red wine and tomato mixture. If you have a walloping huge Le Creuset frying pan like me scooping can be less crippling on the wrists! Note that I sometimes braise the shank mixture in the Le Creuset pan rather than transferring to a roasting pan. Depends on the size of the lamb shanks and whether I adjust the recipe quantities. Give everything in the roasting pan a bit of a fiddle around so that the shanks have all had a coating of the wet mixture, and the mixture is distributed evenly. The shanks should be about 1/4 to 1/3 exposed. Cover loosely with a piece of tin foil and place in a medium low oven (130C to 150C). This is where I get vague. Until cooked! Maybe 2.5 hours or so depending on your oven. You will need to turn them with a pair of tongs every half and hour or so to ensure they don’t get dry. They are done when the meat is literally falling off the bone. You can tell this by giving one a poke with a fork and if the meat just separates with a wee nudge you are sorted. Serve with either cous cous or mashed potato. And some steamed greens such as beans or broccoli. They freeze really well. I tend to strip the meat off the bone and freeze in individual portions with some of the jus mixture. Other ideas – strip the meat off the bone and use the lamb / wine mixture as the filling for a pie. Photo coming when they are out of the oven. b) people who are baffled by the packets of interesting things in Asian food stores – but feel that they must be able make something delicious if only one knew what they are for. 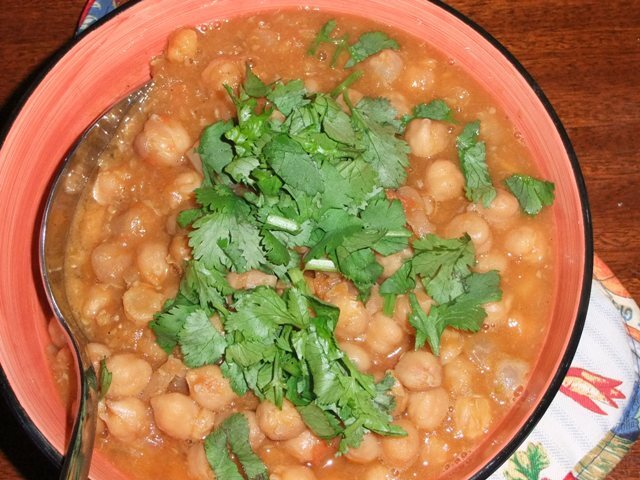 Channa masala is also known as chhole batura, pronounced chho-le. It’s one of the easiest vegetarian dish you could make – with the help of a certain special indian chhole masala. We cook it when we want some wholesome home food and we don’t have much in the fridge. You usually have dried chickpeas stored in your cupboard somewhere near the red lentils (which is also one of our favourite meals on a cold and rainy day). I use a chhloe masala spice mix from a specialist Indian store. My favorite brand is MDH (photo below). The spice mix is not hard to make, but often the ingredients are hard to come by and you don’t need too much for one pot. So I use this mix as its closest to making it fresh. I add fresh garlic and ginger to the recipe which is possibly not traditional, but is how I saw my mother making this curry as a little girl. A pinch of baking soda if using dried chickpeas – apparently makes it softer faster. You can probably do without it or use it while you’re soaking it. Soak your chickpeas overnight (or if you have a pressure cooker, you only need to soak about an hr and then cook it in the pressure cooker with the rest of the process). Don’t throw out the water. You will use it in your cooking. Chop up your onions, garlic and ginger (leave some of the ginger to add at the end as well). I usually cut the ginger into thin flat slices. Slice your green chilli down the middle (if you don’t want it hot, remove the seeds) – one little chili shouldn’t heat up your pot of chickpeas! Heat oil in a thick based pot. Add onions, garlic, ginger and the chilli. Meanwhile chop up tomatoes and coriander. Once your onion, garlic & ginger are nice and soft and almost brown – add the tomatoes – stir well. 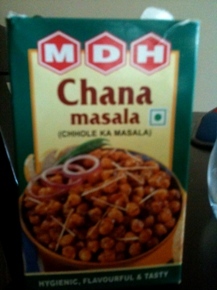 Add 2 tablespoons of the chhole masala – stir well. Then add in your soaked chickpeas, stir it up – then add the rest of the water it was soaked in. Then cover and cook for at least an hour in the pot. If you’re using a pressure cooker, 30 mins will do. If using canned chickpeas reduce the time by 1/3. Once its cooked through, add the coriander – leave some for garnishing. Serve with hot rice or have it with naan bread or just by itself. Wholesome and tasty and healthy! Done! p.s. if you want to make your own chickpea spice, there are heaps of recipes of the same on the internet. I feel its not worth making it unless you make this curry often. Also this recipe and process can also be found on the back of the masala box. Side dishes are often the most neglected part of a meal. I have a few friends who sweat their way through the production of a main course and a dessert for dinner parties. Even the thought of doing more anything more elaborate than open a packet of mesclun salad greens (and upending into a bowl. Voila! ); or steaming a bit of broccoli can bring on a spasm. An interesting side dish is a useful thing because it can compensate for a simple (and easy) main, and turn a meal into something special. This particular side is one that I whip up quite a lot and generally serve with simply prepared meat such as a roast. A friend commented once that Jamie Oliver does something similar. This wasn’t amended from anywhere intentionally. I add chilli flakes to it. Not enough to drown out the freshness of the beans but enough to give it a wee kick. Much approval from Lulu who furtively gnaws on raw chillies with whatever you serve her. Don’t get precious about quantities. You can do this to taste. If you are doing a roast, have everything prepared and start the beans at the point you remove the roast from the oven to rest. Then everything will arrive at the table at the same time all nice and hot. Top and tail. Or just top the green beans depending on how damaged they are at the ends. Heat the oil in a wok (preferred) or large pan, then throw everything else in. Toss around a few times and saute on medium. When the tomatoes show a bit of a sign of breaking down, cover the wok and stir from time to time but keep the steam in. 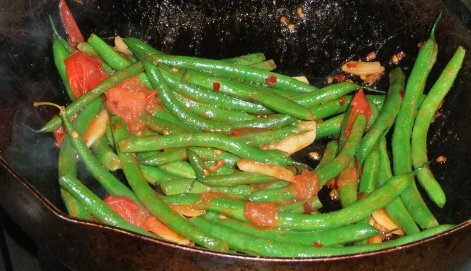 The tomatoes will go into a bit of a mushy paste around the beans. It is ready when the beans are at the level of cookedness that YOU like. I like them slightly underdone. Tip into a bowl and serve. There is no real need to salt but you can add a pinch of sea salt at the beginning if you like. 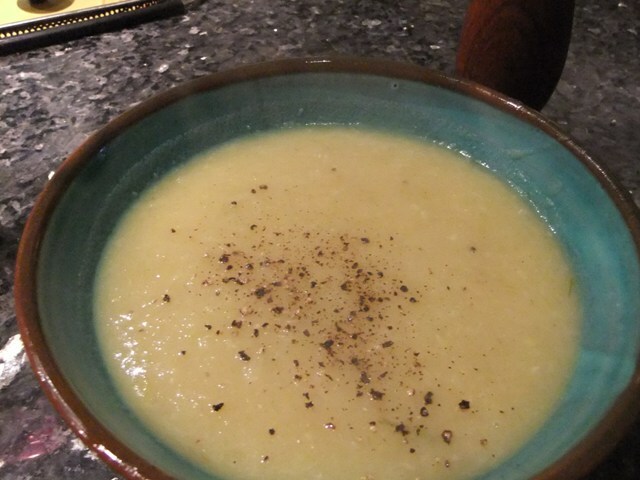 Leek and potato soup is one of my favourite soups of all time. For some reason I always have it in my head as being more fiddly to make than a hearty chicken and vegetable soups (which I make all the time for lunches in winter – and which take loads more time to slice and dice). In fact it is very straightforward to make and is absolutely delicious. In theory it can be served hot or cold. I have never been a huge fan of cold soups. It feels faintly wrong! Don’t get super precious about exact quantities. Approximate is fine. Key thing is to roughly match the quantities of potatoes in leeks. And using a decent stock does make a difference. Heat the olive oil in a large heavy based pan or saucepan. Add all the leeks, onions, garlic and bayleaves. Saute on medium to low for at least 10 minutes until the leeks are wilted and the onion and garlic are cooked and well softened. In a stock-pot or very large saucepan, heat the stock until just boiling. Add the leek mixture and the potatoes. Cover and simmer on low until the potatoes are cooked to softened but not disintegrating. Season with salt and pepper. Remove the bayleaves! And blend in the food processor in batches to whatever smoothness you like. Serve hot with any of the following: dollop of sour cream; bit of chopped parsley; some grated parmesan. This soup does freeze well but you shouldn’t keep it indefinitely. This is one of my staple “throw it together” pasta sauces. Generally whipped up when I have a crisis moment peering into the fridge and pantry. The recipe was inspired by one from the River Cafe but I tend to ignore things like the added cream etc which aren’t necessary. I made this last night in order to take a meal to my friend Sue who has recently given birth to twins and is still in hospital. I have been absolutely appalled by the hospital food which all seems to look like boiled brown airline stew with overcooked peas on the side. No matter what it says on their menu. It freezes very well so I will also be freezing her a couple of portions to reheat when she gets home from hospital. The anchovies add richness and saltiness – but don’t give this sauce a fishy taste. Heat the oil in a heavy pan. Gentle saute the garlic on low heat till softened but not turning brown and crispy. Add the rosemary and stir for a minute to infuse the flavour. Add the anchovies and stir them around until they are melted into the garlic mixture. Tip in the tomatoes and roughly chop with a wooden spoon. Leave to simmer on low until the sauce thickens. Maybe 25-30 minutes. Add the half cup of parmesan. Serve with papardelle and extra parmesan.